Use VirtueMart’s promotional tools such as banner ads, specials, featured products, newsletters, product notifications, and more, which are important factors in determining the success of your business. Chapter 7, Promotion and Public Relations, describes the promotion and public relations tools available for VirtueMart. 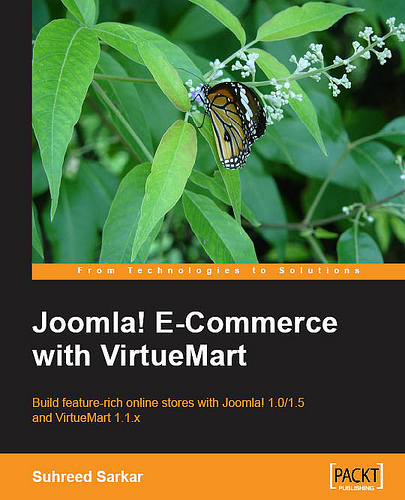 This chapter teaches you to use VirtueMart’s promotional tools like banner ads, specials, and featured products, and also to use coupons to attract more customers. This chapter also explains how to use newsletters and product notifications to keep continuous communication with your customers and to use VirtueMart’s product review feature to express customer experiences. Chapter 9, Extending VirtueMart’s Functionalities, deals with third-party extensions to extend VirtueMart’s functionalities and tweaking some extensions to suit your need. This chapter teaches you to use the appropriate extension for bulk import/export of products to your VirtueMart shop catalogue and to use product tag clouds. This is followed by using testimonials and commenting to improve product review and using wholesaling. You also learn to use social networks and bookmarking sites to spread the news about your site. You learn to update multiple product information at the same time using AJAX. You can also spice up your shop by using the new visual cart module, display slideshows with product images, and include modules in the content items, after reading this chapter. I stumbled across your essay on VirtueMart this morning. As a fairly recent arrival in the Joomla world, I want to tell you that your piece is hands down the best orientation to VM I have seen in the year I've been actively using Joomla. Comprehensive, clear, practical. There is an enormous amount of work that goes into something like this. As a writer myself I recognize how much labor you've invested here. Thank you! You've given a gift to the whole VM user community. You deserve a wide following for your skills in making Joomla accessible. I hope that people find their way to you. I am going to post a note on a few forums about this helpful essay.